It's finally here! Week 10 of the daisy sketch series at Scrapbook Steals (please click here to be directed to the blog post for this week's sketch and here for the blog detailing how to enter into the drawing for completing all 10 sketches in the series. 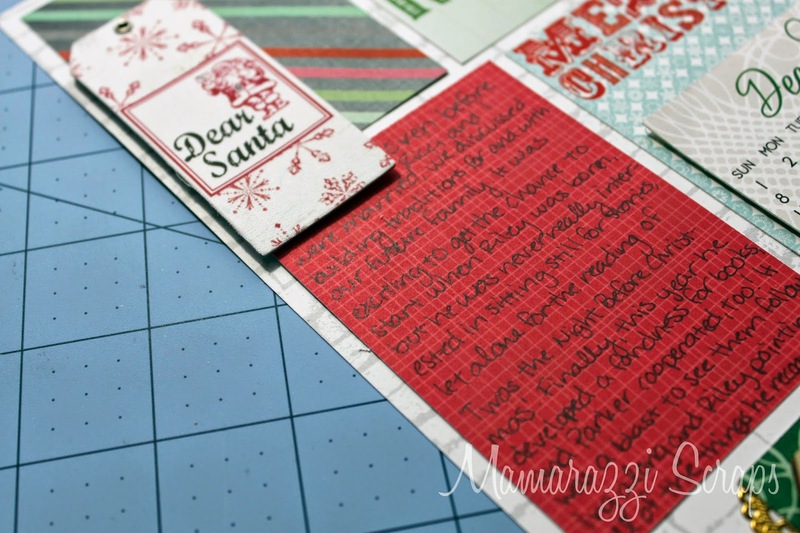 Just recently, on nicolejones911 youtube channel she posted a video of her using scraps to do a block layout. I always love how hers turn out, so I wanted to give it a shot. Then this sketch came out. It was like it was meant to be. I must have gone through several hundred photos before finding one that inspired me. 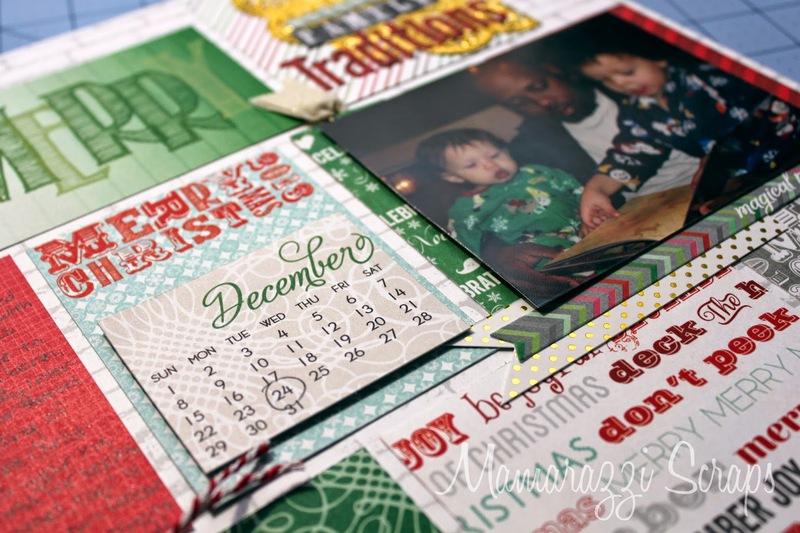 I am still way behind on holiday related events from 2013 (and let's face it, from the couple of years prior as well) and I found papers to work with easily so it was like it was meant to be. The only change I may make before putting this layout away is adding a small veneer above my title, but under a time crunch and doing a lot of things today means I had to get this posted ASAP or miss the deadline. 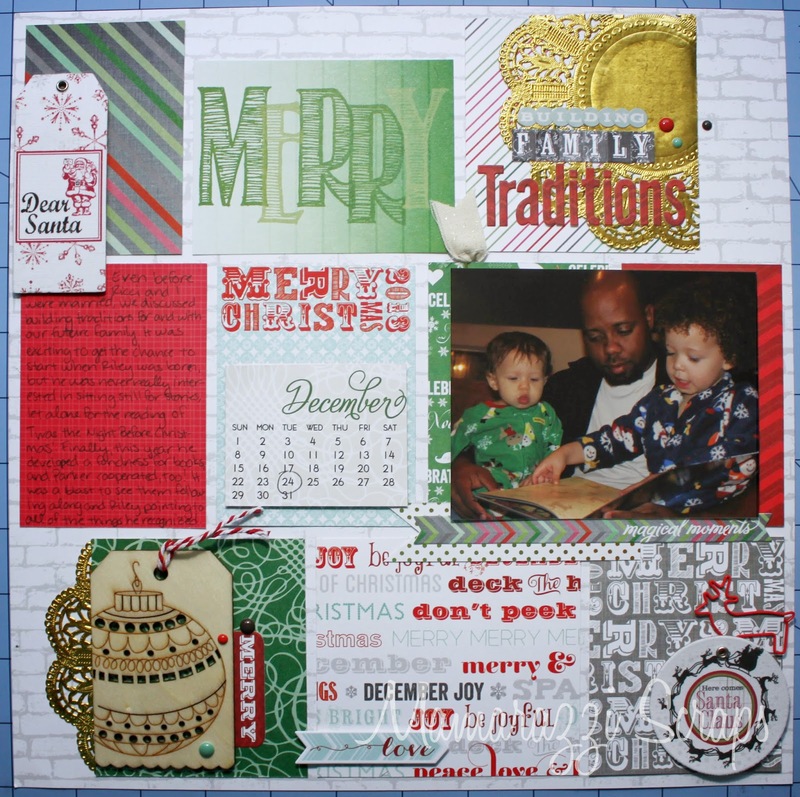 I used bits and pieces from my Christmas kits from Cocoa Daisy as well as paper from my stash from the Christmas line by Allison Kreft for Webster's Pages and a few embellishments also from my stash. The only area of the layout not photographed close up is the bottom right hand corner. All I added there was a reindeer clip and a fabric tag from Little Yellow Bicycle (that was a Tuesday Morning find). This cluster was why I decided to add gold accents into the layout. The stripes were too plain and the title didn't take up enough room on them to really make it a focal point. I love how the gold doily really pulls you in. I used both alphabet fonts on the sticker sheet from the Allison Kreft/Webster's Pages collection as well as a circular font from the winter collection by Fancy Pants Designs. To finish off the title, I added a few enamel dots from My Mind's Eye. 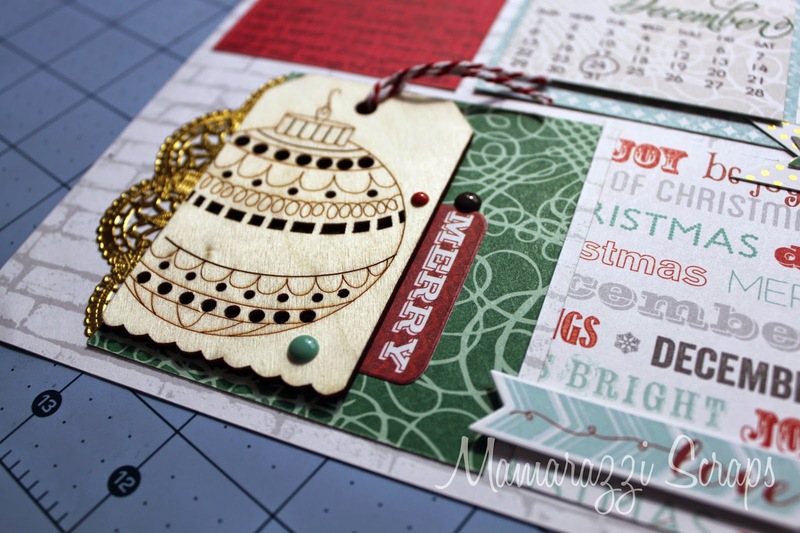 As mentioned before, I will probably add a holiday themed veneer or two before putting this layout away to balance the large ornament tag veneer at the bottom of the page but will have to do that when I have more time. I took this photo at an angle like this to emphasize the dimension on the calendar and the photo. After adding the flag paperclip to the upper left of the photo, I had to pop it off the page to keep that corner from sticking off the page. 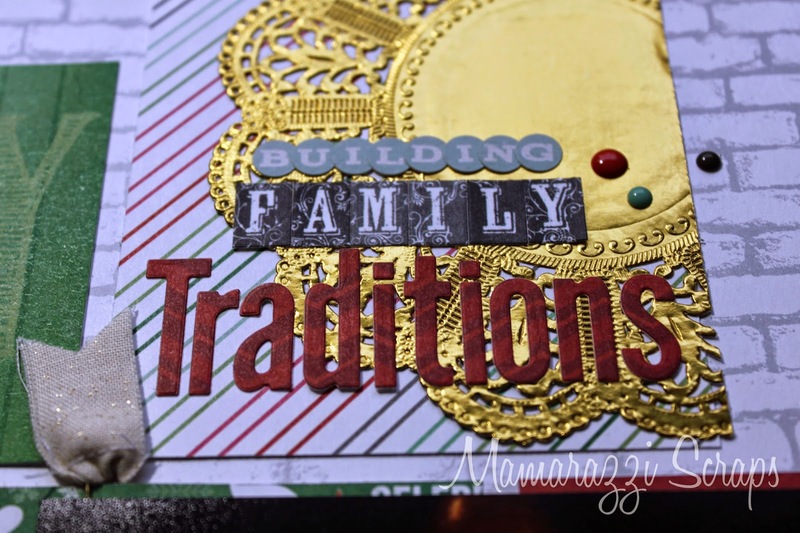 To add another pop of gold, I added a piece of Chic Tags paper that I had already cut into a banner shape that ended up leftover from a previous project. On top of that, I added a sticker from the same sheet as the two alphas in the title to tie in with the paper block on the upper left of the page. I love the calendar element and on the blue paper (both cut aparts from the Webster's Pages collection) and it fills the space where a second photo was called for in the sketch perfectly. I marked the date on the calendar and the writing on the blue card denotes that it was for 2013. I love these wood veneer tags that I found after Christmas at Michael's for only a few cents. I knew I had to add one somewhere on the page and this was a great spot. The red and white twine came from the kits. I added a piece of the gold doily that I had left as well. I also added another sticker from the same sticker sheet I used elsewhere and layered a few more of the My Mind's Eye enamel dots on top. For once, my journaling fit the allotted space perfectly. It was like I did it on purpose. It looks a little tough to read here, but it is perfectly legible in person. I talked about how my husband and I had looked forward to building traditions with our future family well before we even got married, the excitement we felt when we finally got to start after our oldest was born, our minor dismay with his non-interest in books prior Christmases and how great it was that he was finally interested in the stories and pointing out the objects he recognized this year (our youngest was also fairly content to sit and listen). Above the journaling, I added another one of the Little Yellow Bicycle fabric tags and just love the extra texture that it provides. Please note that these pieces come with foam adhesive already on them, but only a couple small pieces. I had to add an extra piece to keep the center from bowing upwards, it probably wouldn't have been a bad idea to add more to it. The circle tag didn't seem to require any extra adhesive, but time will tell how they hold up. Thanks so much for stopping by! I'm thrilled to have completed all 10 without having to catch up. It's been close to two years since I've been able to say that!! #BHhideandseek Game - I Found One!